Paleoanthropology is a specialized branch of physical anthropology and paleontology involved with the study of ancient human beings. Paleoanthropologists investigate the origin and subsequent evolution of humanity by examining fossil remains and other ancient evidence. Evolution-based paleoanthropology holds that humanity evolved from ape-like ancestors, and therefore the subdiscipline frequently includes the study of living and extinct primates. By contrast, Biblical creation-based paleoanthropology holds that humanity was created by God as described in the book of Genesis. Secular paleontologists assert that hominids began evolving from other primates starting around 8 million to 6 million years ago. Evidence of hominid activity between 8 and 2.5 million years ago usually only consists of bone remains available for study. Because of this very incomplete picture of the time period from the fossil record, various aspects of physical anthropology (osteometry, functional anatomy, evolutionary framework) are essential to explain evolution during these first millions of years. Evolution during this time is considered as the result of natural forces only. Creation paleontologists look to the Bible for insight into human history. The creation account in the book of Genesis tells us that humans and all land animals were created on the same day. This is in stark contrast to the assertions of evolutionary paleontology, which holds that hominids were evolving over millions of years and Homo sapiens only appearing a few hundred thousand years ago.. The creation account also reveals that human beings are distinct from the animals and uniquely formed in the image of God. Biblical paleoanthropology is concerned with two separate periods of human civilization: the humans living before the global flood and those that lived following. The book of Genesis begins with an account of the original world and its civilization that no longer exist. Details regarding this first civilization are minimal, except for a terse genealogy, accounts of men like Enoch, and reference to a mysterious race known as the Nephilim. Genesis reports that this original antediluvian civilization became intensely wicked and for this was destroyed by a global flood sent by God about 4500 years ago. No verified fossil evidence of this preflood human civilization has been found and it doubtful that any trace survived the devastation. One very important distinction between the pre and post flood human beings was their longevity. Prior to the flood, Genesis 5 records that people lived extraordinarily long lives: routinely over 900 years. Methuselah is known for living longer than any other human in history, dying at the age of 969. This longevity is believed to be so extraordinarily long in part because environmental conditions were optimal for longevity before the Earth was destroyed, perhaps maintained by a dense atmosphere which collapsed during the flood. After the flood, the lengthy human lifespans gradually declined to over several generations. This Biblical insight offers an explanation for the robust human morphology seen in some post flood groups such as the Neanderthals and Homo erectus. Subsequent to the flood, Genesis 10 records the Table of Nations; a genealogical record that names and describe a number of individuals that established early civilizations. The account is by no means exhaustive, but does name people who are reputed to have established Egypt, Greece, Canaan, and Sheba, as well as cities such as Tyre. The key post-flood Biblical event that factors into the development of human races and language is the Tower of Babel. According to Genesis 11 , all humans spoke the same language immediately following the global flood. Those who migrated to the east and settled in the land of Shinar decided to build a city and a great tower out of baked bricks to make a name for themselves. It may be argued that because there is no archaeological evidence of buildings from antediluvian civilizations, the Tower of Babel was the first major monument ever built of which any evidence might remain. God intentionally scattered mankind to retard their technological advancement by confusing their speech. The origin of the various root languages is presumably linked to this event. God apparently created several unique languages to scatter humans throughout the world. This action almost speciated humans into several groups allowing physical differences to develop. All human ancestry traces back to Noah and his family only 4500 years ago, and then even further back to Adam and Eve. We are all close relatives, and the differences that distinguish the human races should be considered superficial at best. Jonathan Sarfati comments on the relation of these post Babel humans to so called "cave men". Evolutionists believe that humans evolved from an ape-like ancestors that descended from chimpanzees, and assign both humans and apes to the same taxonomic Family - Hominidae. Most creationists would deny that humans have evolved in this manner, and instead believe that these ancient hominids were either fully ape or fully humans. The two primary taxonomic genera of ape-men clearly delineate this distinction. With rare exception the taxonomic genus homo contain groups identified as true humans (as with Homo neanderthalensis, and Homo erectus), and those assigned to Australopithecus being true ape. 2. 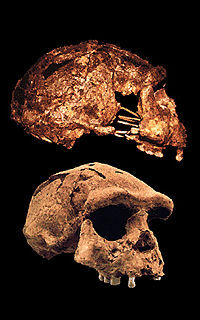 Emphasize certain humanlike qualities of fossilized ape bones, and with imagination upgrade apes to be more humanlike. 3. Emphasize certain apelike qualities of fossilized human bones, and with imagination downgrade humans to be more apelike. Although it would seem that evidence for human evolution is announced in the popular media with regularity, this is largely due to a practice known as taxonomic splitting. Evolutionary paleoanthropologists seek desperately to identify a true transitional form between man and apes, and much fame and prestige can be obtained from finding a new species of hominid. As a result, any fossil that is found with a minor variation is claimed by its discoverer to be a new species of ape-man. Concerns regarding the widespread practice of taxonomic splitting are summarized by Tim White, co-director of the Laboratory for Human Evolutionary Studies at the University of California, Berkeley. 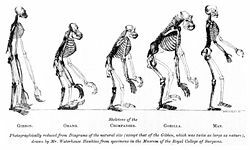 There’s been a recent tendency to give a different name to each of the fossils that comes out of the ground, and that has led to what we think is a very misleading portrayal of the biology of human evolution. The following is a summary of some of the species of humans declared from fossil evidence alone. New Hominid Species Not A Missing Link, Scientists Say Doubt over claims that we descended from new species and disagreement about how close a cousin it was. Inside Science News Service Apr 8, 2010. "Key" Human Ancestor Found: Fossils Link Apes, First Humans? Australopithecus sediba had human-like face and could walk well upright but was apelike in other ways. National Geographic News, April 8, 2010. Fossil Skeletons May Be Human Ancestor Newly discovered australopithecine discovered in a cave in Africa. LiveScience, April 8 2010. Evidence that human brain evolution was a special event Howard Hughes Medical Institute, December 28, 2004. ↑ Introduction to Paleoanthropology/Definition Wikibooks, Accessed September 26, 2011. ↑ Homo erectus 'to' modern man: evolution or human variability? by A. W. (Bill) Mehlert, Journal of Creation 8(1):105–116, April 1994. ↑ Menton, David. The New Answers Book,Chapter 8: Did Humans Really Evolve from Apelike Creatures? February 25, 2010. ↑ Fossil evidence for alleged apemen—Part 1: the genus Homo by Peter Line, Journal of Creation 19(1):22–32, April 2005. ↑ Skull wars: new ‘Homo erectus’ skull in Ethiopia by Carl Wieland, Creation Ministries International. March 22, 2002. Early Man by Sean D. Pitman, M.D. The Puzzle of Ancient Man Seminar by Donald Chittick recorded in 2004 at the Seattle Creation Conference. This page was last modified on 29 April 2014, at 19:10.